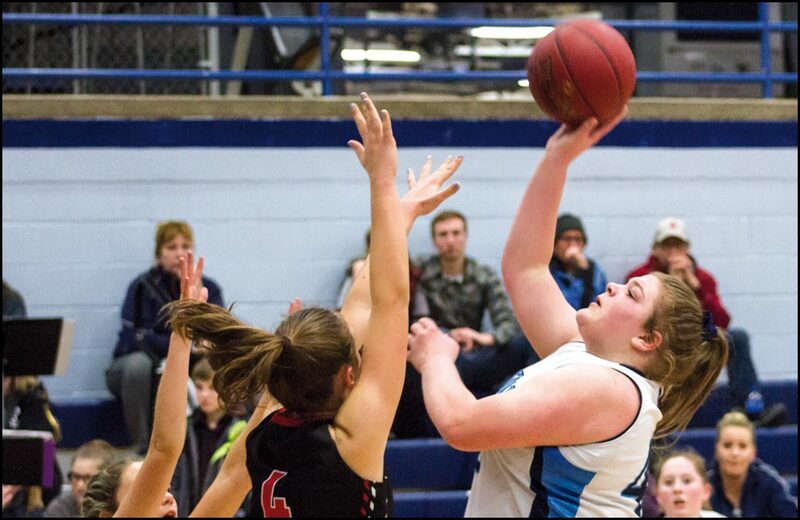 Bailey Smith scored 14 of her game-high 17 points in the first half as she led the Chewelah Cougars to a 55-30 league victory at Wilbur last Saturday night. Smith was one of only a few girls on the floor who could get the ball to drop through the hoop as both teams shot a low percentage from the floor and from the free throw line. She scored nine of Chewelah’s 15 points in the opening period and five more before halftime as the Lady Cougars pulled away to take a 28-12 lead and continued to double-up the Wildcats in the second half for the win. Saturday’s win on the road offset Friday night’s 54-35 home loss to the St. George’s Dragons. The Cougars entered this week’s schedule with a 9-4 season record, 2-2 in league play. They are currently in fourth place in the northern division standings. Smith drained four shots in the first eight minutes with three layups and a short jumper from the side. A rebound basket from Natalie Sheppard, a layup by Taya Tapia and two free throws from Alyssa Fitzgerald gave the Cougars a 15-7 lead over the young Wildcats who have two eighth graders on their varsity roster. Chewelah scored the first seven point of the second period as Fitzgerald put back a rebound and hit an inside shot on a pass from Becca Bennett, and Smith hit a three-pointer. Another shot from behind the arc by Sheppard, a driving jumper from Smith and a free throw by Kennedy Robison gave Chewelah a 28-12 halftime lead. Frequent whistles led to the shooting of 19 free throws in the first half. Wilbur-Creston went five-for-eight. Chewelah made only four-of-11, but the Cougars outshot the Wildcats from the floor, 11 to three. A 10-point run toward the end of the third period stretched the Chewelah lead to 45-21. The two teams played an even first four minutes of the period as Chewelah got baskets from Smith and Lexi Robertson to give the Cougars a 35-21 lead midway through the quarter. Robison then canned three shots, Bennett hit a jumper from the side, and Smith took the ball to the hoop for a layup for 10 straight points that extended Chewelah’s lead to a 24-point spread. Bennett’s long three-pointer from the top of the arc highlighted the fourth period for Chewelah. The Cougars also got two inside jumpers from Robertson and a driving layup from Robison to complete the 55-30 win. Smith’s 17 points led all scorers. Fitzgerald was also in double-digits with 11 points and Robison added nine to the Chewelah total. Points were scarce on the home side of the scoreboard through the first half on Friday night against St. George’s as the visiting Lady Dragons took a 24-10 lead and coasted to a 54-35 win over the Lady Cougars. It was difficult to perceive that the Cougars were playing in their familiar home gym as one shot after another failed to fall through the hoop. Bailey Smith’s back door drive from the left side with 19 seconds remaining in the period produced Chewelah’s lone basket as the Dragons took a 12-2 lead. The Cougars had open shots throughout the period but failed to drop any more into the cylinder. Even second shot opportunities and put-backs off rebounds refused to ripple the net. Lexi Robertson’s old school three-point play started the second period. She drove the lane, put up a shot off the glass, and made the free throw after the foul. Taya Tapia then launched a shot from beyond the arc that closed the scoring gap to 15-8 in the first minute, but Cougar shots still did not make much of an effect on the scoreboard. Robertson hit another inside shot and that ended Chewelah scoring for the first half with the Cougars trailing 24-10. Both teams had taken about the same number of shots. The difference up to halftime was that Dragon shots dropped through the hole in the net while Cougar shots did not. Other than that, it was an even ballgame. Chewelah had a much better second half. The Cougars scored more points in the third period than they had in the entire opening half. Alyssa Fitzgerald drained a free throw after being fouled on a put-back of her own shot, Natalie Sheppard hit a turn-around jumper on the inside, and Fitzgerald scooped a layup. Two back door layups by Smith plus three-point shots from Becca Bennett and Fitzgerald left the Cougars on the short end of a 42-25 score, but Chewelah saw 15 points added to the home side of the scoreboard. The Cougars finished with a strong fourth period, but they were unable to narrow the scoring deficit. They got a three-pointer from Robison, inside shots from Robertson and Hailee Hunter-Lee, and a duo of free throws by Smith. Still, Chewelah absorbed the loss by a 54-35 final score. Smith led the Lady Cougars with nine points. Robertson scored seven and Fitzgerald finished with six. So, the Cougars (9-5) ended up with another split for the week, posting one win and one loss. This week, they continue their weekend schedule as they host Davenport here on Friday and travel to Kettle Falls on Saturday. Both games begin at 6 p.m.